Todd Tracy, the attorney who shook up the collision repair industry by winning a $31.5 million verdict against a shop who failed to follow OEM procedures on a 2010 Honda Fit, reiterated at SEMA that he would subject aftermarket parts to a crash test. The Tracy Law Firm owner said he plans to subject an unaltered 2010 Honda Fit and a 2010 Fit loaded up with crash parts to the Insurance Institute for Highway Safety to a small-overlap crash test. The test bangs a quarter of the vehicle’s front into a barrier at 40 mph, simulating a front edge of the car striking a pole or tree. 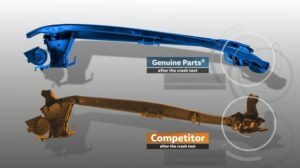 There was a flurry of interest a few years ago in crash-testing aftermarket parts and publicizing the results. However, nobody really seems to be checking them in this manner since 2012, the year the government boosted interest in OEM lightweighting with CAFE standards and the Insurance Institute for Highway Safety launched the small-overlap crash test. However, a preview of this coming attraction might be found in a less-intense Volkswagen test conducted in 2016 and publicized earlier this year on YouTube by Volkswagen Ireland. Continental on behalf of Volkswagen ran what appears to be a form of moderate-overlap crash test of an unaltered Golf VII (model year unknown) and an equivalent one with five aftermarket parts. The Golfs were crashed at 9.4 mph “in order to keep the cars in a repairable state,” according to the video’s narrator. The test Golf VII sported imitation versions of what the video called five of the parts most likely to be damaged in a collision: the fender; hood; bumper fascia; bumper beam; and “front mask,” which appears to be a reference to the radiator housing. The two cars ended up with “significantly different” results, the narrator states. The video unfortunately didn’t highlight the differences — if any — perceived in four of these five parts. However, Volkswagen did find that “the grave deviations in quality caused much greater damage” to the bumper beam — arguably one of the more important of these five parts. Because the aftermarket reinforcement couldn’t absorb collision energy as well, the airbag deployed at a mere 9.4 mph — “leading to greater damage inside the car cabin,” the narrator states. Not surprisingly, “the airbag does not need to deploy” at that low a speed for precisely that reason, according to the video — you’re making a mess to protect an occupant who doesn’t need it. Likely because of this reason, the repair costs for the car tricked out with aftermarket collision parts were three times more than if OEM parts had been used. He planned to put the control Fit, the aftermarket Fit and a third with an erroneously adhesive-bonded roof (also crashed in a 40 mph small-offset test) on tour and show insurers “this is what an aftermarket part looks like” and what happens with shops don’t follow OEM specifications. Correction: An earlier version of this article listed the incorrect model year for the Honda Fits. All are 2010s. The article has since been updated to reflect the change.